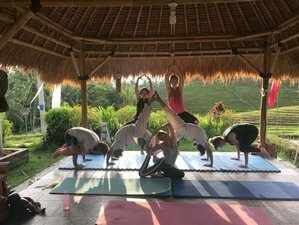 Join Balitrees retreats for a traditional and unique Balinese Pencak Silat (martial arts), meditation, and yoga experience. This retreat is located in the real Balinese village, close to Mount Batukaru, in the middle part of Bali island. Step aside from daily busy life and unwind in a beautiful compound set in amidst of the rice field and lush tropical healing garden. Either you come alone or with your friend, ensure you give time to listen your true self within. Your life is your journey, so enjoy it! During this retreat, you will be staying at any homestay or guest house/bungalow type of accommodation, spreading across the Sesandan Megati Village. Balitrees Retreats offers an authentic taste of Bali, nestled in the quiet traditional village and the main retreats area (yoga, other activities, dining area) are surrounded by the rice paddy farmlands of Sesandan Megati village. It is located approximately 30 minutes west side of Tabanan city. Balitrees Retreats has several different locations of homestay or guest house/bungalow type of accommodation, spreading across Sesandan Megati village. It is about five minutes distance from each location of accommodation to reach the main retreats area (yoga, other activities, dining area). Balitrees Retreats will provide shuttle service to connect each location of homestay or guest house/bungalow type of accommodation to the main retreats area (yoga, other activities, dining area). One of the most popular world martial arts legends, Budhi Dharma, with his original style of Kalaripayattu and Kundalini, is well-known for his spiritual trip from India to China. On the way, he stopped in Indonesia, Malaysia, Thailand, and other places to spread his knowledge of Buddhism. One historical place that he stopped in Indonesia is Mount Batukaru at Tabanan, Bali. He spent 18 years in Bali to spread Buddhism, as well learning the 72 original style of Balinese Martial Arts (Silat) from the last generation of Silat Arda Chandra lineage master, Ki Goplo. Ki Goplo is the last disciple of Silat Arda Chandra from Seruling Dewata style. Silat Arda Chandra has 12 styles, one of them is Silat Seruling Dewata. Silat Seruling Dewata divided into 72 original styles such as drunken style, Tali Rasa (Balinese Tai Chi), earth and sky style, tiger style, snake, eagle, mantis, crane, monkey, dragon style, and so on. After mastering all 72 original Balinese silat, at 641 AD Budhi Dharma announced the founding of Silat Seruling Dewata at Mount Batukaru in Tabanan Bali as an independent style, continuing the past Silat Arda Chandra lineage and Budhi Dharma becomes the leader of the first generations. Nowadays, Silat Seruling Dewata is led by Ki Nantra, as the leader of the ninth generations. A few years after founding Silat Seruling Dewata, Budhi Dharma continued his spiritual trip to spread Buddhism to several places and ended in China. In China, he founded the world-famous martial arts style, which is the Shaolin Temple style. After founding Shaolin Temple, Budhi Dharma did not come back to Bali to lead Seruling Dewata but prefers to handover it to his disciple, the second leader which is the twin master Ki Mudra and Ki Madra. Note: This is a sample of daily itinerary. It might be changed on daily basis due to any certain conditions, like wheater conditions, daily special event, etc. Balitrees Retreats is located at Sesandan, Megati, Tabanan, Bali, Indonesia. It is close to Mount Batukaru, about 30 minutes from Tabanan city, 45 minutes from Tanah Lot Temple, and two hours from the airport. During the retreat, you will be served three times daily meals on your preference, regular meals / vegetarian meals / vegan meals. Most of them based in Balinese and Indonesian culinary. Tea, coffee, juices, water, and snacks will also be available. You will also participate in a Balinese cooking class. One time modern massage or traditional massage is included in the package. Please book your flight to arrive at Ngurah Rai International Airport (DPS). Please take airport taxi to Tabanan city. Transfer from Tabanan city to Balitrees Retreats is included in the package. Balitrees Retreats will pick you up from the airport as well with an extra charge. Airport: Ngurah Rai International Airport Airport transfer available: Ngurah Rai International Airport (US$45 per person) Additional charges may apply. You can request this in the next step.